Entry Limited to the First Five Teams! We’ll play stableford each day for the team and an eclectic for the week for the individual. It’s a great way not to worry about a nine! Friday, May 29 – Depart the USA. Saturday, May 30 – Arrive at Shannon Airport. – Arrivals should be scheduled prior to 8:00 AM. – Transfer to the Killarney Park Hotel (3-night stay). – Welcome dinner and drinks this evening. Sunday, May 31 – Play Waterville Golf Links. Monday, June 1 – Play Old Head Golf Links. Tuesday, June 2 – Play the Old Course at Ballybunion Golf Club. 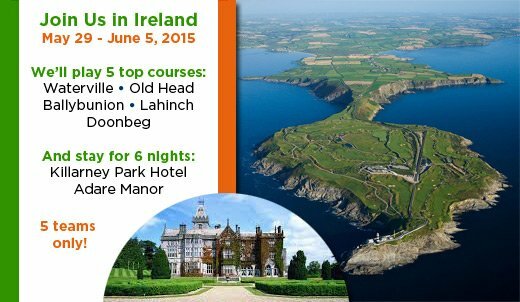 – Following golf transfer to Adare Manor (3-night stay). Wednesday, June 3 – Play Lahinch Golf Club. Thursday, June 4 – Play Doonbeg Golf Club. – Awards dinner and drinks. Friday, June 5 – Depart Shannon Airport for the USA. – Transfers will be provided for flights leaving around 8:00 and again about 11:00 AM. Click here to view flyer & full details!